The Denver-based boutique and online retailer Goldyn recently sent its fall lookbook to a variety of bloggers. 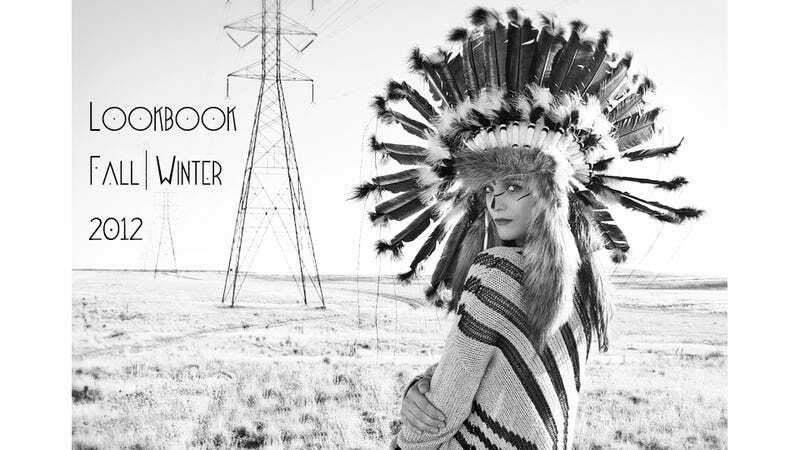 The lookbook featured two models posing in front of teepees, while wearing Plains Indian-style headdresses (along with Helmut Lang sweaters, Cynthia Vincent dresses, and T by Alexander Wang dresses, of course). Even leaving aside the issue of appropriating Native American culture and textiles in general, many Native American people find the appropriation of headdresses particularly offensive — both because of the way it promotes the stereotyping of Native cultures and because headdresses have deep spiritual and cultural significance. They aren't worn by just anyone; they are earned. Appropriating these powerful symbols of Native American culture just recalls the myriad other ways that Native Americans have been victimized over the centuries in the good ol' U.S. of A. Urban Outfitters And The Navajo Nation: What Does The Law Say? Chicago fashion blogger Meagan Fredette found the Native American cultural appropriation — which seems to be a fashion trend that just will not die — irritating, and wrote Goldyn to say so. As a half-white female, I don't know that it is my place to comment on issues surrounding Native peoples. But since this landed in my inbox, I do feel compelled to speak up (while acknowledging that I do come from a place of racial privilege). Additionally, marginalized people should not have to bear the sole responsibility for speaking up against their oppression; as white people, we should listen to them and help educate others about their concerns when we can, as best we can. The use of the headdress, poorly-rendered war paint, and teepees in your look do not add any significant creative aspects in your lookbook - these symbols are too loaded with history to ever be considered something other than what they are. By devaluing these symbols into fashion accessories (on white models, no less), you have effectively presented an unfortunate stereotype of a culture that to this day, continues to endure hardships that you and I will never know. That fact is very important! White people have historically treated Native Americans with absolute cruelty, what could possibly give us the right to steal what few traditions they have left? It is not "exotic" or "edgy" or "ironic". You are not "paying homage" to their history. You are making a racist mockery of their culture. And for what? To sell some Helmut Lang sweaters? I was forwarded your email by Courtney, our Director of Marketing and PR, and was absolutely saddened by your interpretation and judgement of our recent lookbook shoot. I am so incredibly sorry that you felt we were mocking Native American culture; this could not be farther from our intentions, which I will explain below. Please do not be so quick to make conclusions or negative judgements of others, however, without knowing our own background or context. These were not fake tipis or a fake landscape made as a "set" for our shoot... We shot our lookbook in our home state of Colorado at the Plains Conservation Center, which is a non-profit that is south east of Denver, which educates children and the public about Native American culture and causes. Our thinking was, why not take advantage of the fact that Native design is so trendy in fashion right now, and utilize that in order to help promote this non-profit and bring awareness to actual Native causes that people can donate to. We worked with the PCC on the shoot and it's concept, and we sent out PR on their behalf - that was essentially the trade arrangement we made with them. They were very happy to have the support and were incredibly kind to us in return. Additionally, one of our main staff who helped conceptualize the shoot and who was there on location is half Cherokee. I myself absolutely love and adore Native American culture on a very real level, and have practiced certain aspects of Native American religion since I was young. My mother actually runs a non-profit that provides assistance to impoverished members of the local Native American community in Boulder, Colorado, and so I grew up around friends who were of Native American descent my whole life. I loved the idea of honoring this culture in our shoot because it rang a very deep, personal bell with me. If you find this insulting that I, as a Caucasian woman, would revere another culture that I feel a connection to, then I am sorry you have such a negative, non-inclusive perspective. In short, our intention was to honor and pay homage to the culture in a very real way, not in a way that was meant to be exploitative or hokey. I can understand if you are upset that a white model was wearing a headdress, and if this in particular was what offended you, I do apologize. That is a touchy thing, which I understand, however let me further explain the art direction/higher-level concept behind the whole shoot in defense of that choice.... The concept for the shoot was 'early homesteaders meet Natives on the plains, in a re-imagined, fictional time period that has elements of both past and future,' as a representation of the fact that modern American culture is a melding of many different cultures. As such, our female model played the part of both sides - Caucasian homesteader, and Native American. Again, this was not meant to mock or create a caricature, but rather pay homage to the plains on which our store actually sits, and the mixed cultures from which it came. In any event, once again I apologize if our shoot offended you. Please know that our intention was only to honor the culture and to even help promote its causes in a very real and authentic way. Hopefully you can choose to be open-minded and culturally inclusive enough to see that. Barcus' response is almost as tone-deaf as her store's fashion shoot. We opened-up our site free of charge to Goldyn, but we were not at all involved in any of the details in organizing the specifics of the shoot. We are very careful to show reverence for and are continually deeply concerned about how we teach of the cultures of the short-grass prairie. By no means would we have endorsed anything offensive towards any cultural group. I believe the store's intentions were wholly good, but perhaps they were naively unaware of how some of the images might be reviewed by others. We did not see the images before they were printed. Zeitler added that as far as she is aware, "The store is deeply apologetic for offending anyone," and will be taking the offending images off its Web site. Goldyn has released the following statement in regard to this: "We are deeply apologetic if any images from our recent lookbook photo shoot were construed to be culturally insensitive. Our intentions could not have been farther from this, and came from a positive place. We had hoped that working with the Plains Conservation Center would help to build awareness for this local non-profit; we did not intend to hurt or offend a culture for which we have a deep respect and admiration." We mean this from the bottom of our heart. No one involved ever intended to hurt, offend, disrespect, mock or insult anyone. We have removed the images from our website and will not be using them moving forward. She also added that the female model used in the shoot is "half white and also half Cherokee."